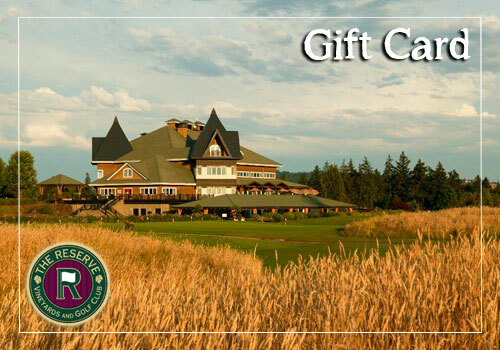 The Reserve offers gift cards, the perfect present for the golfer who has everything! Gift cards can be used to purchase green fees and cart fees, as well as merchandise from the Golf Shop. They can also be used for lunch and dinner purchases in The Reserve's Vintage Room Restaurant. You will be amazed with how easy The Reserve's gift cards are to use. Your customers, employees, and families will be delighted with the many choices they have when they receive a gift card from The Reserve. Questions? Please contact the golf shop at 503-649-8191. Thank you!